Sometimes the best way to get something done is to make a promise. 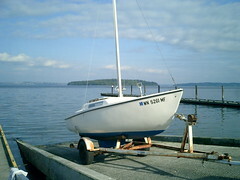 I usually get my boat in the water sometime during May; but Bjorn came home last weekend and wanted to know if he could go sailing this week before he started his summer work in Lynden. So I promised that if he helped me, I would get the boat in the water this week. As you can tell from my recent blog postings, I have been focused on preparing the boat. Well, this evening we launched Blue Wing and brought her to her mooring. Unfortunately, there was no wind, so we had to motor over. But at least she's ready to go. Bjorn might take her out tomorrow. So the next time you need to get something done, just promise someone it will get done, and you'll get it done.